When I first started planning for my retirement in my 20s, I anticipated being on my own without a pension or Social Security. Now that I'm getting closer to retirement age, I realize that I may receive some retirement benefits through the Social Security Administration. When I start receiving benefits affects my monthly Social Security check for the rest of my life. That is, if I choose to collect checks prior to normal retirement age, then the monthly amount is reduced; likewise, if I wait until I'm past regular retirement age, I receive a bigger monthly check. So, among the retirement decisions that I need to make, this one seems fairly significant. I've been reading about this topic and sense that there are two schools of thought in regard to the start of Social Security: 1) delay paychecks as long as possible using any means possible to get the highest monthly benefit – unless you're nearly certain you're gonna die before full retirement age; or 2) it depends. I'm in the “it depends” camp. That's because, personal situations vary widely. In addition, economic conditions often change, making a good choice in one scenario look more or less attractive in another situation. For example, right now, earning more than 1-2% annually risk-free seems impossible. But if the economy changes and I could earn 5% per year in an FDIC-insured savings account, then starting my paycheck at full retirement may be better than delaying. On the other hand, if market returns are likely to stagnate or turn negative (and I have plenty of cash to ride out the storm), then it could make sense to wait. Or, if I needed to take on high-interest debt in order to pay my bills in my sixties, then it may make sense to start receiving paychecks earlier rather than later. Fortunately, I don't anticipate this situation. But my point is that the Social Security decision is related to other aspects of my financial life and investment opportunities. At this point, though, I'm not making the decision of when to take my first Social Security check. Instead, I'm just beginning to understand my choices. I can get an estimate of my monthly paycheck for retirement benefits by setting up and logging into an account with the Social Security Administration (SSA). Information provided includes an estimate of my monthly check at full retirement as well as amounts at age 62 and age 70. I'll note that the formulas provided above mesh with the dollar amount indicated in my SSA dashboard for the delayed retirement (within a dollar) but don't match the early retirement number exactly (there's a $4 difference). The basic formulas for early retirement and delayed retirement are consistent. However, the formulas are applied differently to those born earlier because full retirement age varies from age 66 years to 66 years and 10 months compared to later-born folks like me (our full retirement age is 67 years). According to the SSA, the average retirement benefits check for retired workers in December is $1,461.31. I don't know how that number reflects takers at full retirement age, earlier or later. To demonstrate how the calculations work, I'll use $1,200 as the monthly check at full retirement in my spreadsheet — and allow that number to be adjusted. At a glance, choosing to delay retirement seems like the best choice. More is better, right? But when I stop to think that starting earlier allows me to collect more checks overall, then I realize I need to consider the impact of getting cash earlier albeit in smaller amounts. In addition, I may want to consider the time value of money. That is, if I could invest these checks or get interest after depositing them in a savings account, my decision about when to start could be influenced. I can use the Social Security's calculator to determine how waiting or taking money early affects my monthly check. But I decided to design a spreadsheet that could illustrate what all of my choices. In addition, my own spreadsheet lets me see how my start dates impact the total (or cumulative) amount of money collected. Further, the spreadsheet could give me an idea of how long I'd need to live (and collect checks) in order to make waiting the better choice. There are two numbers I'll need to estimate in order to populate my spreadsheet: 1) the monthly check at full retirement (which I'll enter as $1,200 but can adjust higher or lower if desired) and 2) an interest rate or investment return (which I'll enter as 3% but can also adjust higher or lower). A third number could solve the puzzle of when to begin checks: the age at which I'll die and stop collecting checks. For this project, though, I'll entertain the possibility that I could live anywhere from 62 years to 100 years. If you'd like to buy my spreadsheet/course, you can peek at my calculations and see what you think. I've also outlined my thought processes so you can design your own spreadsheet if desired. The monthly benefit when checks are started at ages 62 through 70 years; and the cumulative value of those checks at ages 67 years to 100 years. The monthly benefit when checks are started at age 62 through 70 years; and the future values of those checks at ages 67 years to 100 years. The last sheet gives me an overview of break-even points. For example, if I assume a 3% growth rate (which doesn't seem realistic in terms of interest rates in today's environment but could be possible in the future), then delaying retirement makes more financial sense at age 85 and older. On the other hand, if I lived to just 80, then starting earlier may give me more benefits overall. Creating this spreadsheet taught me a very simple lesson for starters: I can claim benefits at any age from 62 to 70, not just 62 or 67 or 70. That is, I can start at age 65 years or 69, three months. This thought is a small nuance but still helps me consider claiming strategies. When experts say that delaying the claiming of Social Security benefits is better than certain types of annuities, they seem to be revealing the inadequacies of annuities as much as promoting the true benefits of delaying. I shouldn't make the decision about when to start benefits without considering other aspects of my financial life. I should also look at how my benefits could be taxed, if I have outside earnings plus traditional IRA distributions. In addition, potential returns and whether these returns are guaranteed should impact my decision. The 8% increase in benefits every year that I delay after reaching full retirement age can be misleading (depending on how I do calculations in my head). While it's true that the yearly benefit is higher by 8% every year I wait, I won't earn an 8% return — that's because I'll be skipping earlier payments in order to get the higher paycheck. I won't be financially doomed if I claim benefits at full retirement age. However, since I'm planning on living well past 85, waiting may be the better choice for me. My thoughts on this break-even point seem similar to those mentioned by Michael E. Kitces, CFP, in his in-depth article on delaying Social Security. I've just started to consider the impact of Social Security retirement benefits. I also need to consider the impact of cost-of-living adjustments (COLAs) and other factors as mentioned in this article on when to start collecting Social Security published by the Journal of Financial Planning. I'll plan on performing more complex calculations in a future spreadsheet. 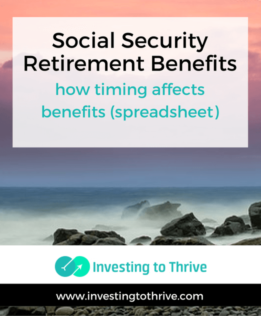 Note: This spreadsheet and instructions are now located at the Social Security Retirement Benefits – When to Start Spreadsheet course. The original spreadsheet was designed for those born in 1960 or later. I've added an additional spreadsheet and instructions for those born between 1943 and 1959. Have you thought about when you'll start claiming Social Security retirement benefits? What influenced your decision? This is an interesting spreadsheet. We’ll try it out. (As someone fairly adept at Excel, I appreciate the time and effort it takes to create something like this.). You indicate that we “….shouldn’t make the decision about when to start benefits without considering other aspects…..” We’re having those discussions right now. Both 63y/o, we’ve been retired for a few years, and considering when to claim Social Security benefits. My thought is that since we do have other significant income sources and don’t need the SS money to maintain our lifestyle, let’s wait to claim. However, her thought is that since we don’t need the SS money to maintain our lifestyle, why should we wait to claim? — why not just take it, it’s ours. An interesting philosophical impasse. Finances won’t be impacted whether we take it sooner or later. We’ll see if this spreadsheet adds some clarity. Again, thanks for the spreadsheet. As I do more work planning for retirement, one of the issues I see impacting cash flow is not just income but taxes. So if you’re looking to consider the financial impact of starting earlier or later, then projecting how these benefits might interact with RMDs, capital gains taxes, Medicare premium surcharges, etc. could be worthwhile. I’ve consolidated your (brilliant) idea into one sheet and changed the rows into years. I have not seen your spreadsheet. Did you account for the fact that social security is currently only expected to be funded 100% to 2034. After that it may only be funded at 77% of schedule.